“Le passe muraille“ is a stereo recording of a highway bridge which marks the limit between the center of the city and the suburbs. 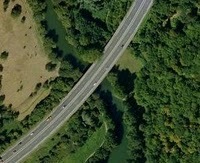 The two microphones are placed under the bridge at the junction point with the road.The right channel corresponds to the entry of the vehicles on the bridge and the left channel, the route the vehicles take to quit the center of the city toward the suburbs. Realized in Poitiers (France) in february 2008, unprocessed field recording. Improvisation realized from materials found by a river. 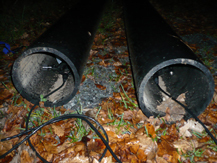 Two plastic pipes used for drainage are lying here, waiting to be installed. They offer a sounding board to the external environment : the hum of the city, the rain. Two cans abandonned some meters away are manipulated around that acoustic space. 2008, without editing or processing. Self taught artist/composer, Thomas Tilly uses the microphone as his main working tool. In 2001, he creates TÔ, a solo concrete music project focusing on environmental sounds and found objects manipulation. In this perspective, composition and publication of sound material on CD must be regarded as a sound synthesis of a place for a certain period of time. (NB: This method requires to stay, observe and study the architectural aspects of the place to make a personal opinion and interpretation thereof). 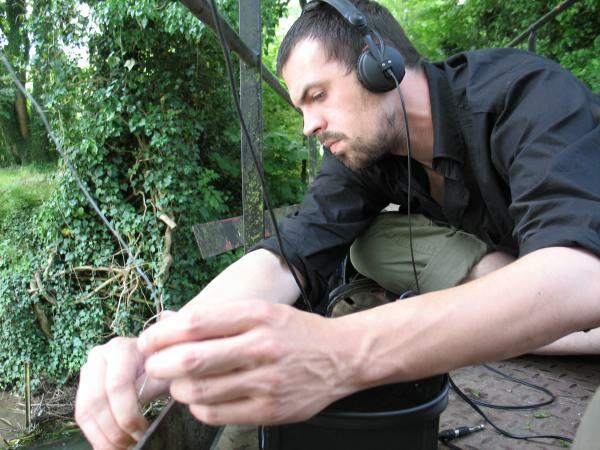 Knowledge of Thomas Tilly is also used for creating sound installations to develop and expand the logic of data collected in a specific place by different trigger / release systems on site. >> Live performance on saturday May, 1 at 9p.m.